This image was taken yesterday. In the morning. On the way to work. I pulled over to the side of the road and waited for a pause in the rush hour traffic on Princeton Pike. Captured with vividHDR on an iPhone 5. Minor edits in Photogene4. I don’t like winter and I’m not a fan of snow. However, I do enjoy snow-covered landscapes. 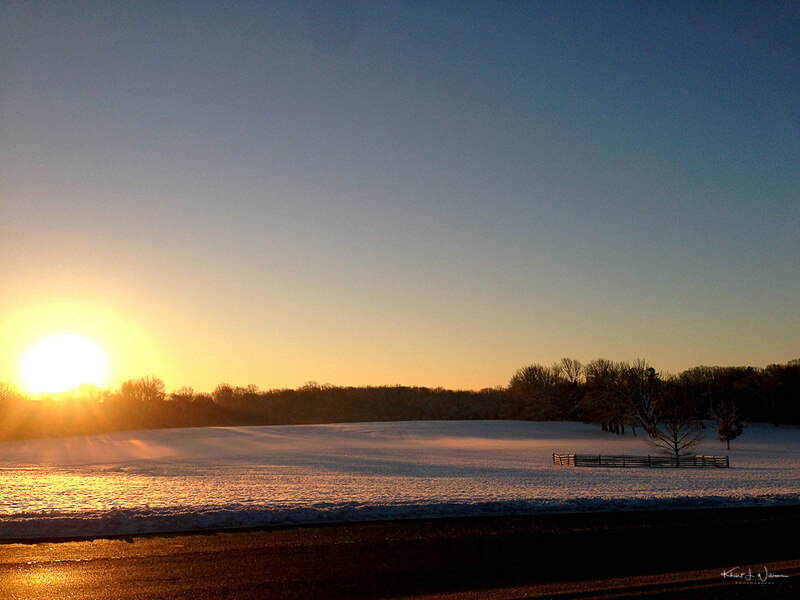 The open fields near Princeton’s Battlefield Park looked lovely this morning. The orange sky reflected nicely off the smooth white glass surface of the snow-covered park. I had to stop and snap a photo. I left my Nikon at home. I normally leave it in the car for easy access when inspiration strikes me. However, the cold weather had me concerned about damage to the camera electronics, especially the LCD I(liquid crystals freeze). I had my iPhone 5. You know the best camera blah. I pulled the image into Aviary and applied the Sedona effect from the Wanderlust pack. This added a much warmer tone to the overall image. Perhaps I was subconsciously thinking about beaches and pretending that the snow as sand and this was the Grenadines. I have never used a cover with my iPhone 5. I just love looking at the sleek metal and glass body. Of course, it has some dings. The worse though is a scratch in the upper middle section of the camera lens. It’s clearly visible in photos with a lot of smooth surfaces, like clouds, heads etc. It shows up as a purple dot on my images. Luckily I have an app, Photogene 2 that has a “heal” feature. I removed the dot and salvaged the image.